you may have picked up on the fact that i am an animal lover if you've been reading this blog for any amount of time. for example, the picture collage of me with a myriad of animals, gushing about our two dogs, playing with puppies in pet stores, stalking the groundhog who lives under our barn, or saving turtles from the road. for years i have wanted a little fluffy bunny. it all started when i was in high school & got to hold a dwarf bunny on one of my many trips to Petland. the bunny's coat was super soft and velvety, it's personality was so laid back, and it would cuddle you for hours. i vowed to myself right then & there that i would someday own a dwarf bunny! 9 years later & that dream has finally come to fruition! we now own a little bunny named Albus Sirius Black! i knew i wanted to name him Albus because, hello Dumbledore! i love the name Albus & although it's not a great dog name, i love it for a rabbit. since our last name is Black, i just knew we had to sneak Sirius in there as well! :) i just end up calling him Albie most of the time though! i can't even remember how the conversation started, but Thomas agreed that a bunny is very doable for us! we talked it over & realized that a bunny would fit well in our lifestyle & budget. bunnies don't require vet visits, shots, etc. like a dog would so that is a huge cost saving! the only time we would have to go to a vet would be if the bunny got sick. they are pretty low maintenance and yet a ball of fun! Thomas has been married to me for over a year now, so i'm pretty sure he knew this deep down too! i really like adopting animals that have been rescued so we actually looked around at different humane societies to see if they had any rabbits. we found one that did have a rabbit about 40 minutes away & we drove up to look at it. this rabbit was so big & Thomas was a little unsure if we could house a rabbit that big. to top it all off, Thomas got a really bad allergic reaction while we were playing with it so we had to leave. we are pretty sure that his reaction was to the kittens in the room next door because he is so allergic to cats, but either way we were uneasy about this rabbit. unfortunately, there aren't many rescued rabbits so we struck out there. we visited a few pet stores in our city, but none of them sold rabbits! i knew Petland had them, so we googled the nearest Petland & called them. they told us that they did indeed have dwarf rabbits, so to Petland we went! i walked in, saw Albus, picked him up, & just knew this was our bunny. we got some food & a box to cart him in while we drove home & we were off! 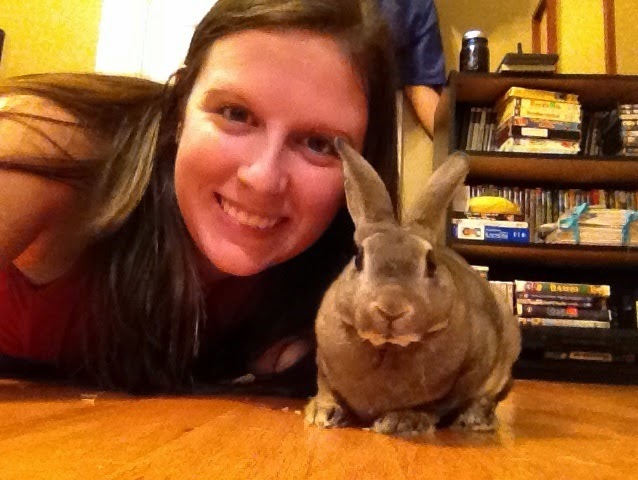 Albus is actually a Dwarf bunny mixed with a Mini Rex so he is double awesome! he is a hypoallergenic breed so we are safe with Thomas's allergies! he will not get very big at all, most adults only get to be about 4-5 pounds! Mini Rex rabbits are one of the most popular pet rabbits in the US! and i can see why - they are small, soft, and so friendly! Albus lets you hold him for hours & he will just sit completely still! i lay on the couch & he just lays on my shoulder completely content! he is so cute! he has really warmed up to us quickly also! we can stick our hand in the straw hut to grab him and he won't bite or scratch at us. some bunnies do this because they are scared, so it would be completely normal if he did this at first. but he has trusted us since the very first time i picked him up & that is the kind of bunny you want! where the cage is going to go (outside vs inside) is still being debated, though. since we have two inside dogs, we talked about Albus living in his cage outside. but bunnies are really sensitive to overheating & summers around here are really hot. plus we live in the woods so there are a lot of animals that come in and out of our yard. so my view is that he can stay inside in the cage. our dogs sniff around the cage, but don't really mess with it too much. of course we would never let him out of the cage with them in the same room, but they are used to be locked out of the living room while we eat & when we put them up for bed. when the weather turns cooler we may move the cage outside, but for now Albus is an inside bunny. i actually had two pet rabbits when i was younger that stayed in an outside cage & so did Thomas. the ones i had were sortof friendly, but it was harder to play with them. and everytime we let them inside they chewed up everything! Albus is still a bunny, so he will chew & we will have to keep a close eye on him, but he is also such a cuddle bunny! he really does have the best temperament & we both love him so much already! have you ever had a pet rabbit? Awww what a precious lil bunny. He is the cutest! I love his little adventurous / curious face! Too cute :) Congrats! OK - you are the coolest. I've never had a rabbit. How long do they live? Albus is adorable. The name is perfection too! What a cutie! I love the name. Congrats on the newest member of your family! AHHHHH!!!! I've just fallen in love with Albus! I lovee all of the photos! Keep them coming! Ever since I saw your instas, I've been wondering how the dogs were handling this new addition to your family! It's funny because my boss has been talking about buying a rabbit for her daughter. Apparently the neighbor has two bunnies THAT SHE LETS ROAM AROUND THE YARD FREE WITH NO FENCE. Isn't that scary? I would be worried a stray dog would come along and bye-bye bunny. He is adorable, and I love that his name is Albus! ha, thanks! :) i love rabbits! they live about 10 years if they are in good health!! thank you! he has been a blast so far!! it has surprisingly gone smoothly! we were a little apprehensive about how the dogs would react but they've done so good! i think that helps my case that he can be an inside bunny too! oh my gosh! that is so scary!!! i wonder how in the world the rabbit stays in the yard?! that is one well trained rabbit! thanks Susannah! :) i love his little nose! Um! I really need to hug Albus! He is so cute I can barely stand it! We had 2 bunnies when we were kids and they roamed around the yard some but never went far. Maybe they just know to stay near. However, I'd be afraid of mean dogs coming in for a rabbit dinner. eeek! Ahhhhh! I love that you have a rabbit! That is so fantastic! yes! he is so fluffy i'm gonna die!!!! :) hehe we love him! thanks! he is a total ball of fun! :) nothing wrong with early birthdays at all, i say! !